Browse content similar to Premier League Schools Tournament. Check below for episodes and series from the same categories and more! kick things off, shall we? I'll never get tired of saying that. Congrats, that's all you're getting me as a City fan. to lift their very own version of the Premier League trophy. pitch at this absolutely stunning beautiful stadium. All right, stop going on about it. Shall we check out the action? tunnel before the tournaments kicked off. will take part in 2 6-asides. we caught up with one team who made a bright start. Look who we found, it's Hull under 11s. How did that go, Sammy? just put it in the bottom corner. Dad's sitting here watching you. it feel watching your son? It's really good to see the team. lot of pressure on him today. Is there a little bit of pressure? I don't think so, no, not really! Do you think you can go all the way? stand, we found some pretty dedicated fans. Guys, who are we here to support? Are you sure you're here to support Liverpool, Jack? Are you sure, because your coat says otherwise. Take it off, let's see. It's been quite a while but you get used to it. What time did you have to get up this morning? We really want to see them. We were very determined to make sure they won. We're behind the team, Danny, we've got so much support here. amazing banner, so, guys, masks on, let's do this, shall we? winning their first two matches. a team I was keen to watch. they will be looking to retain the title. my point of view, I'd rather them lose right now. So that is it, that was the final score, 1-0. Sunderland, they couldn't hack it. knew they needed that goal but City win. we watched my kids in blue. I'm saying it's going to be a 3-0 whitewash. They're here representing Chelsea, let's do it. I saw Watford last year, they played well last year. I'm going to give them a bit of credit. Get out, get out, Watford. Oh, that was a good effort. I am gutted for Watford. to Chelsea and afterwards we caught up with their north London rivals. We are here with the under 11 mixed Arsenal team. I've heard this is a group of lies. Stephanie, you are a Chelsea fan? How does it feel to be here at the home of the champions? It's weird because I never thought I'd be on this pitch. football pitch next to my house. Spoken like a true blue. London derby coming up a little bit later on. We're keeping our fingers crossed for you. We're here with referee, Chris. You made your debut in the Premier League earlier this year. I refereed West Bromich Albion and Southampton. As a kid, it was a dream to Premier League game and I managed it. Did you get a lot of stick? Refs often get the brunt end of things. once I got my first decision out of the way, I was fine. The biggest tip I'd say is, enjoy it and smile. so just enjoy everything you're doing. Now it's time for the semis. but before that, I'm about to make your dreams come true. Follow me, if you want, mate. Calm down, calm down, mate. He's not OK, right now. minders who go with the trophy all over the country wherever it goes. I'm going to get him out of here. Match of the Day Kickabout Gazette. What are you doing, Tyler? action when things were really hotting up in the semifinals. closely fought 1-0 win over Manchester United. OK, can you believe this? Two games have now gone to penalties in the semifinals. We've got City versus United over here. Only two teams can go through. This is tense, this is tense. Crystal Palace go into the final. Chelsea just dropping one penalty. So, heartache for my boys, Chelsea. It's Crystal Palace versus Man City. Let's hand over to our commentator. So this is how Crystal Palace will line up. be leading out his team at Stamford Bridge. Manchester City have never won this competition before. It's the fourth final this team has reached this year. brilliant goals already in the Strand. So, here we go then, and no messing about from City's Gonzales. really alert right from the start. kick-off and he wasn't too far. A busy start at the home of the Premier League champions. Good strength to hold off his opponent. for goal from long range. Mulligan has done well to wriggle out of a tight corner. Mightily relieved to get it away the second time. It could have gone anywhere. that one and keep the game at 0-0. He had every right to have a crack from there. That is Crystal Palace's best effort of the game so far. Palace growing in confidence now. The keeper has been rushed into its clearance. That's even closer than his last effort. are fully up and running. Now, more silky touches from Gonzales. The angle is tight but he brings it in. He has only got one thought on his mind there. 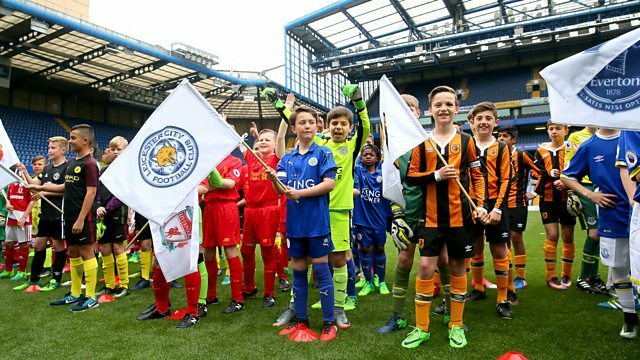 breaking the deadlock in this under 11 Premier League schools final. Two minutes left to go and still 0-0. This cannot go to penalties again. Tyler and Lauren think this might be going to penalties. Last chance for Gonzalez to win it. Oh, he has hit the post. This would have won it for sure. A last look at the watch from the referee. Manchester City is going to go to spot kicks. It is 4-4 in the penalties. First up, Crystal Palace's Spencer. He also scored in the semi, remember. No margin of error for either team. He steps up for Palace. Oh, he has grazed it over. This is a huge opportunity now for Manchester City. It will be McIntire who steps up and he has won it! McIntire scores the winning kick. Guys, how does it feel, you are the schools winners? Onto the second final of the day. It's the under 13 girls and Liverpool versus Bournemouth. Liverpool won their semi-final in comfortable fashion. They beat West Brom by 3-0. Bournemouth have had a similarly impressive run to this final. beat Manchester United 1-0 in the semi. Liverpool captain and one of the top scorers in this tournament. goalkeeper Coleman is rock solid in the back. beaten twice in the tournament and so far. She's always a threat in front of goal. She is a technically gifted player and at the back. Stamford Bridge awaits this final. Bournemouth to get the game started. And any clearance is blocked by Evans. Not enough room to get the shot away. Wetton is on hand to clear for Bournemouth. Now, Henderson looking up to see who's making a run. It's great vision but just too far in front of Evans. The goalkeeper is alert to the danger. all the clubs presented here today. They don't want to give her too much room. Here she goes danger for Bournemouth. She sweeps into cut out the cross. on Brough from now on. The last touch came off the Liverpool player, so no corner. Liverpool beginning to pull the strings in midfield. can tell they will pounce. Henderson, that's really good movement. And that's a magnificent goal. The way she shifted her balance. The speed of the footwork. The devastating power of the shot. and it's rightly gotten Liverpool in front. So, suddenly Bournemouth are chasing the game. Henderson is the last defender. Going to have stoop here to head it away. They are giving it everything. Bournemouth continue to push players forward. She's done well to cut it out and goes for goal herself. Just couldn't catch it cleanly enough. have to try their luck now. really good finish from the captain. been their day so far. Liverpool now searching for a third to really wrap up the game. The shot was well saved by Saunders. under 13 Premier League schools tournament. They did expect to win! 11s and Liverpool for the under 13s. It's my first time here and I have absolutely loved it. The talent has been absolutely incredible. today but before we go. Oh, my one dream of scoring at Stamford Bridge. Go on, get out of here, you've shamed yourself.